Home / Technical Articles / Is Wind Power the Answer to Small-Scale Renewable Energy? Wind Power. A subject that is close to my heart (literally, as I live in a very windy valley!). Ok, so it makes sense to begin at the beginning; that is, explain the basics of wind power and the ideas behind it. So, wind power is the conversion of wind into a useful form of energy e.g. using wind turbines to create electricity. But this is not the only form of energy that it is capable of being converted into, other forms such as using wind mills for mechanical power, wind pumps for pumping water or drainage, or sails to propel ships with kinetic energy are also applicable. 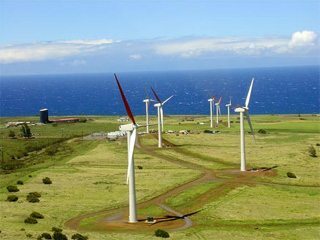 At the end of 2010, worldwide capacity of wind-powered generators was 196.6 GW, with over 90 countries worldwide using wind power commercially. Some, however, are recently starting to doubt the ability of wind power to provide enough energy on a global scale (power output vs. Needs of nation) for it to be economically viable (see recent article in the Telegraph). However, it is still unquestionably one of the most popular methods of renewable energy on a personal scale, owing to a number of factors that will be discussed later. In terms of electrical uses on a large-scale, wind farms are the key. These are a collection of many wind turbines (as pictured) to collect as much wind power from one economically-viable area as possible. Wind Farms are connected to the electric power transmission network, whereas smaller facilities are used to provide electricity to isolated locations. Utility companies increasingly buy back surplus electricity produced by small domestic turbines. Wind energy, as an alternative to fossil fuels, has plenty of positive factors. It is plentiful, clean, renewable, widely distributed, and produces no greenhouse gas emissions during operation. However, the construction of wind farms/turbines has been frowned upon in some communities and areas, as it can have a large visual impact aesthetically. Yet, with some of the most viable areas for wind farming out to sea (and thus more wind farms being built at sea) this could be a small complaint of the future. Any effects on the environment, nevertheless, are generally among the least problematic of any power source, making it a favourite amongst the more environmentally friendly. In a wind farm, individual turbines are interconnected with a medium voltage, power collection system and communications network. At a substation, this medium-voltage electric current is increased in voltage with a transformer for connection to the high voltage electric power transmission system. In small scale wind energy generation, the surplus power produced by domestic microgenerators can be fed into the network and sold to the utility company, producing a retail credit for the microgenerators’ owners to offset their energy costs. This works on a retail credit system, the same as that used in small scale solar power generation. Induction generators are often used for wind power. These systems include substantial capacitor banks for power factor correction. Different types of wind turbine generators behave differently during transmission grid disturbances. However, induction generators cannot support the system voltage during faults, unlike steam or hydro turbine-driven synchronous generators, making this a sight weakness of the system. 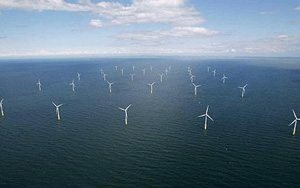 Since wind speed is not constant, a wind farm’s annual energy production is never as much as the sum of the generator nameplate ratings multiplied by the total hours in a year. The ratio of actual productivity in a year to this theoretical maximum is called the capacity factor. Typical capacity factors are 20–40%, with values at the upper end of the range in particularly favourable sites. The inherent properties of wind limit the capacity factors, unlike fuelled generating plants. Capacity factors of other types of power plant are based mostly on fuel cost, with a small amount of downtime for maintenance. Nuclear plants, for instance, have low incremental fuel cost, and so are run at full output and achieve a 90% capacity factor. Electricity generated from wind power can be highly variable at several different timescales: from hour to hour, daily, and seasonally. Annual variation also exists, but is not as significant. Related to variability is the short-term (hourly or daily) predictability of wind plant output. Like other electricity sources, wind energy must be “scheduled”. Wind power forecasting methods are used, but predictability of wind plant output remains low for short-term operation. Now that the ins-and-outs of generating electricity using wind have been covered, it’s time to take a look at the practicalities of using it on a personal scale. To do this we have to look at what is called Microgeneration. This is described as the small-scale generation of heat and power by individuals, small businesses and communities to meet their own needs, as alternatives or supplements to traditional centralized grid-connected power. Although this may be motivated by practical considerations (such as unreliable grid power or long distance from the grid) it is primarily used to describe the environmentally-conscious and their approaches to generating power that aspire to zero or low-carbon footprints. Additionally, studies have backed-up the environmental impacts of wind power on a small-scale in the UK. 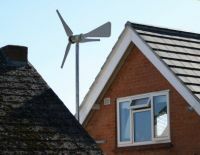 A new study by the Carbon Trust into the potential of small-scale wind energy has found that small wind turbines could provide up to 1.5 terawatt hours (tW/h) per year of electricity (0.4% of total UK electricity consumption). This is saving 0.6 million tonnes of carbon dioxide (Mt CO2) emission. (This data is based on the assumption that 10% of households would install turbines at costs competitive with grid electricity, around 12p a kW/h). These figures show it not only makes financial sense to make use of wind power, but makes a massive difference environmentally. Wind turbines have been used for household electricity generation in conjunction with battery storage over many decades in remote areas. In terms of the practicalities, turbines should be mounted on a suitable tower to raise them above any nearby obstacles. Another approach to positioning a small turbine is to use a ‘shelter model’ to predict how nearby obstacles will affect local wind conditions. Models of this type are general and can be applied to any site. They are often developed based on actual wind measurements (obviously preferable) and can estimate flow properties, such as mean wind speed and turbulence levels at a potential turbine location. They do this by taking into account the size, shape, and distance to any nearby obstacles. A small wind turbine can also be installed on a roof. But installation issues then include the strength of the roof, vibration, and the turbulence caused by the roof ledge. Small-scale rooftop turbines suffer from turbulence and rarely generate significant amounts of power, especially in towns and cities. Also, in locations near or around a group of high-rise buildings, wind shear generates areas of intense turbulence, especially at street-level. The risks associated with mechanical or catastrophic failure have thus plagued urban wind development in densely populated areas, rendering the costs of insuring urban wind systems prohibitive. Moreover, quantifying the amount of wind in urban areas has been difficult, as little is known about the actual wind resources of towns and cities. So it seems that whilst wind turbines seem like a great idea for urban personal renewable energy, it may be best left to those in areas high above sea level, or in less densely populated urban areas, and of course the most environmentally conscious. However, due to factors like; ease of installation, benefits to the environment and ability (in the right conditions) to easily (and effectively) produce electricity in many different environments, wind power will continue to be a popular source of personal renewable energy. I too regard this as a major problem in the development cycle of ‘wind power’. Again, this is part of what seriously limits its usefulness in a more urban environment. Hence the development of more isolated and off-shore wind farms! Noise generated by wind turbines usually do not comply with properties’ boundary noise regulations. This is a big problem that is usually ignored by the approving authorities. I agree, escpecially when it’s a big investment (20 and more wind turbines). Folks living near wind parks are often really suffering from noise coming from turbines, and cannot do anything about it.